That itself is the paradox. How can someone be welcome to somewhere that sounds terrific? But that’s the gist of this movie, Hotel Transylvania 3, directed by Genndy Tartakovsky. Before the opening credits, the movie introduces us to two lead figures: Dracula and a human who calls himself Professor Van Helsing. Following a series of Jack-and-Jill fashioned encounter between Van Helsing and Dracula, the vampire wraps up the deal. But Van Helsing vows to avenge. Van Helsing shares many similarities with Professor Moriarty of the Sherlock Holmes saga. Like Helsing, Moriarty was a fictitious character produced to create a rift between Sherlock Holmes and Dr Watson. He is the criminal mastermind whom Holmes describes as the Napoleon of crime. The writers, Michael McCullers and Genndy Tartakovsky, must probably have been largely inspired by Sir Arthur’s darling mischief-maker, Professor Moriarty. 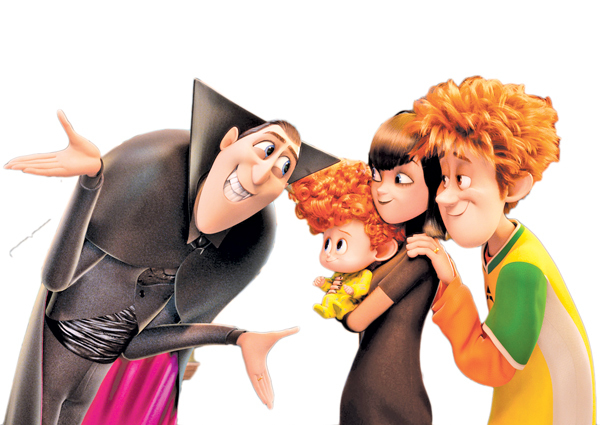 Hotel Transylvania 3 is, of course, a silly animated movie that offers you a great deal of fun. That said, the production has a few interesting themes running underneath. First, it stirs up our memory of the Hitlerist fascism that wished to see a world purged of Jews. Second, the battle between the monsters and humans can relate to many oriental as well as occidental aspects. The orientalism, in fact, is brimming with such bi-partisan battles. Suras and asuras, manussas and amanussas can count in as a few examples in orientalism whereas the battle between good and evil is an ever-present phenomenon in the occidental lore. Tartakovsky’s attempt is to erect a new platform to the already-prevailing themes. He poses the question of good and bad. How can we define the good and the bad? Who are we to define the good and the bad (and forget about the ugly)? The good is not superior and the bad is not inferior. Hotel Transylvania 3 is Tartakovsky’s attempt to celebrate monsterism or place it on part with humanity. Van Helsing in a Hitleric wavelength is giving a chase to the monsters. But then at the end, his own life was saved by a monster itself. When he questions why he was saved, the monster (Dracula) responds the obvious: “Because we are the same!” Dracula voices similar concerns in the opening scene by saying that hate should not be entertained to which Van Helsing turns a deaf ear. He never forgets his revenge and continues the scheming with his great-granddaughter. Following the opening credits, Van Helsing becomes a distant memory until we are halfway through. On that note, we see how Dracula makes every step to save Ericka without knowing she is the daughter of his eternal enemy. This humanity of the monster finally leads Erica to change her attitude towards the monsters. Though she admits, at first, that the monsters are disgusting to her great-grandfather, she later changes that attitude with teary eyes. It rips apart our thinking which seems to stagnate on a conservative plane. It leads us to believe that we need to crack down our own attitudes towards monsters. Who are the monsters? We need to crack down all the monsters in the fairytales. Perhaps the future of humanity might change on this wheel. That change will be the antidote to the current chaos. The so-called die-hard Hitler followers will be forced to abandon their fascist attitudes because of its obvious catastrophic murderousness. In terms of Hotel Transylvania, it is the cluster of monsters that are equipped with over-powerfulness in contrast to the intellectual prowess of the humans. We live in a maybe monstrous world that it’s hard to imagine a phenomenon without monsters. We have to employ the monstrous tone to make our voice count – it is part of who we are in the global population, especially in Sri Lanka. Hotel Transylvania 3 weaponises that part of the human condition. Throughout the production, the monsters seem to share all the human features: a fondness for entertainment, being emotional and looking for soft companions. Ultimately it is the socialization that steps to the fore. Monsters are supposed to be anti-social. But inside Hotel Transylvania all the monsters ache for socialization. Only Count Dracula is without a partner. Even his daughter has a partner, a human. Dracula, though a monster, teaches us the core values of family. He places family over and above everything else. He applies the element in love as well. The crux of the plot unfolds with the relationship between Dracula and Erica the captain of the ship who is also the great-granddaughter of Van Helsing. At first, Erica feigns her romantic feelings for Dracula as she wants to implement her great-grandfather’s scheme. At a certain point, she admits that a relationship between a human and a monster is unthinkable. Both Van Helsing and his great-granddaughter detested Dracula because he is a monster. For them, Dracula was a heretic, rebel and a thing to flout. But Dracula and his love had the wit to win. He drew his own circle and took both great-granddaughter and great-grandfather in. It was Erica who entered his circle first. Her feigned love turned out to be a feigned attempt to revenge. But she could not go on with either. She gave in. Finally, she was the one to save the life of Dracula who had almost given up hopes in the death throes. Van Helsing’s attempt to crush Dracula with the mystic music that awakens the death giant is another core element. Each time, Dracula’s party had to outscore Van Helsing with a positive note of music to lull the death giant into a softer move. Even the most horrible creatures can be calmed down with the aesthetic sense. Funny enough, the contest between the Van Helsing and Dracula’s party reaches the bottom line with the ‘Macarena’. Van Helsing himself begins to dance to the tune of that song. 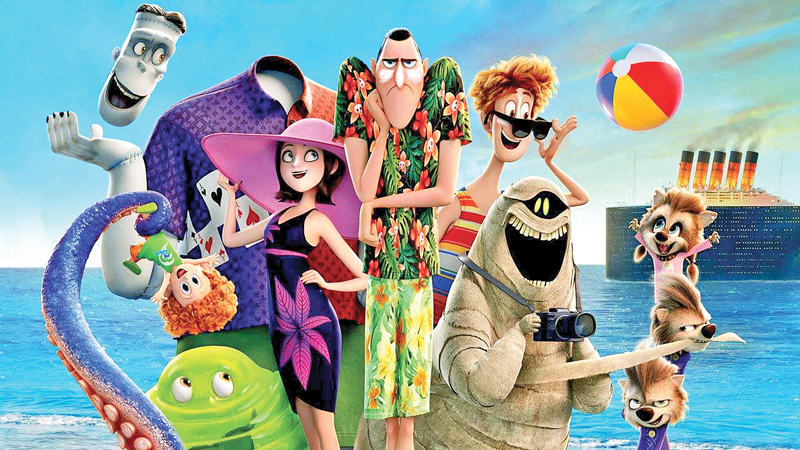 When it comes to fun, yes, Hotel Transylvania 3 is absolutely a thumbs-up experience. When it comes to themes, the production deserves a heavier yes as we leave the theatre with much to meditate on.